L is for Lunch, lamb and lush. Yesterday we celebrated Mother's Day. I cooked a selection of curries, some had previously been frozen to free up the day. The two curries I cooked over the weekend were a Lamb Dansak and a Beef Madras. (Mary Berry version - altered to use frylight instead of oil. Heat frylight in a large frying pan. Add half the lamb and fry until browned. Remove from the pan with a slotted spoon and set aside, then brown the other half of the lamb and set aside. Add more frylight to the pan. Add the onions and fry for 4-5 minutes until beginning to soften. Meanwhile, place the ginger, garlic and chilli in a small food processor and whiz until finely chopped. Bash the cardamom pods with the end of a rolling pin to split the husks, then remove the seeds and grind them to a fine powder using a pestle and mortar. Add to the pan along with the remaining spices and the garlic and ginger mixture. Add the remaining ingredients to the pan and add the lamb. Bring to the boil, then cover and place in the oven to simmer for 1-2 hours until tender. Check the seasoning and serve. At stage 5 after adding the ingredients I placed the casserole dish in the fridge so the meat could marinate over night. Spray pan with frylight . Add the onions, cloves and cardamom pods. Stir fry for 3-4 minutes. Add the chillis, ginger, garlic and dried chillis and stirfry for a further 2 minutes. Add the curry powder and beef chunks and stirfry until meat is sealed. Add the ground coriander and cumin and stock. I then slow cooked it the following day. I prepared the spices for both curries on Friday afternoon and had a senior moment - not sure what happened but all I can say is I am not sure what exactly was in each of the curries, but they were delicious! 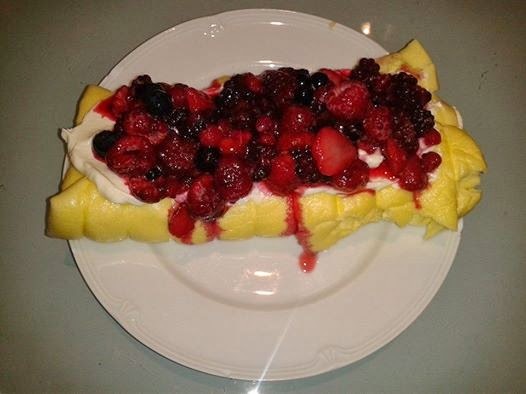 For desert I made a roulade which was so lovely, difficult to imagine it was diet friendly....lush! Spread on baking parchment or foil & cook gas 4 or 180 for 15 to 20 minutes until brown. Mix the rest of sweetener & quark spread on cake add strawberries & roll. This is a bowl - trust me. 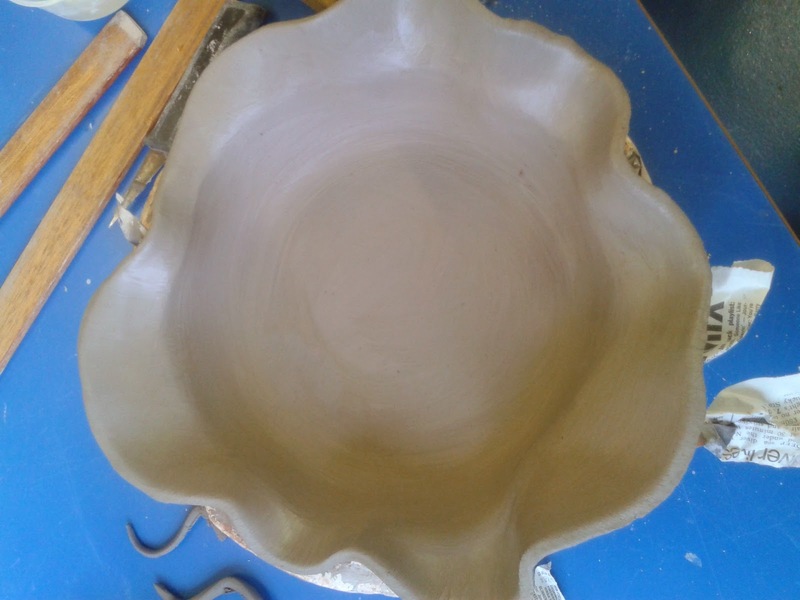 Imagine lining a pastry dish - that's what we did with the clay, but instead of trimming the edge I decided to have an arty farty moment. 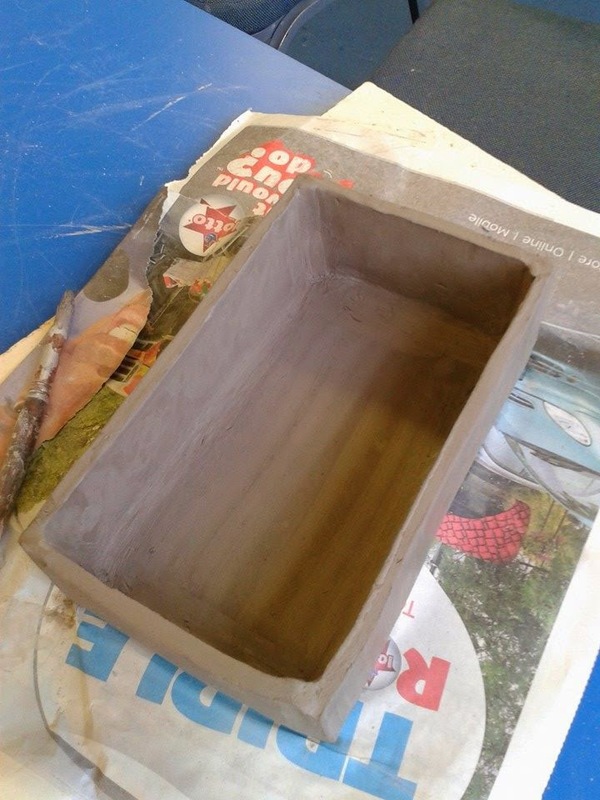 Next week we have the entire session devoted to glazing ready for the kiln! For Mother's Day this Sunday, the family are coming here for a curry festival - a change from a traditional dinner. Curries are so much easier to prepare in advance and freeze, so that on the day itself I can load up the heated trolley next to the dining table and enjoy time with the family. I did the curry festival last year and decided to try a few new curries......Click on the links below to see ingredients. This is my K contribution to ABC Wednesday. 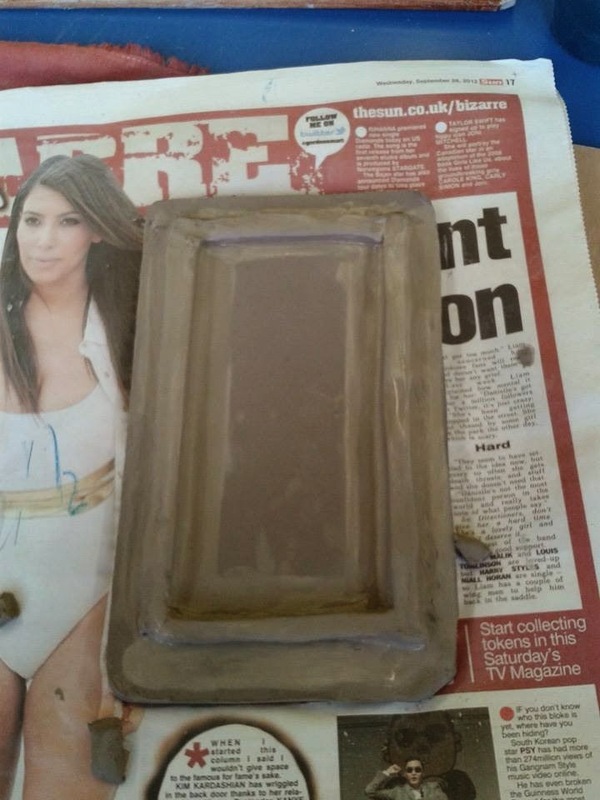 There was only 2 of us at pottery class this week, so we got lots of attention for our "slab" task. 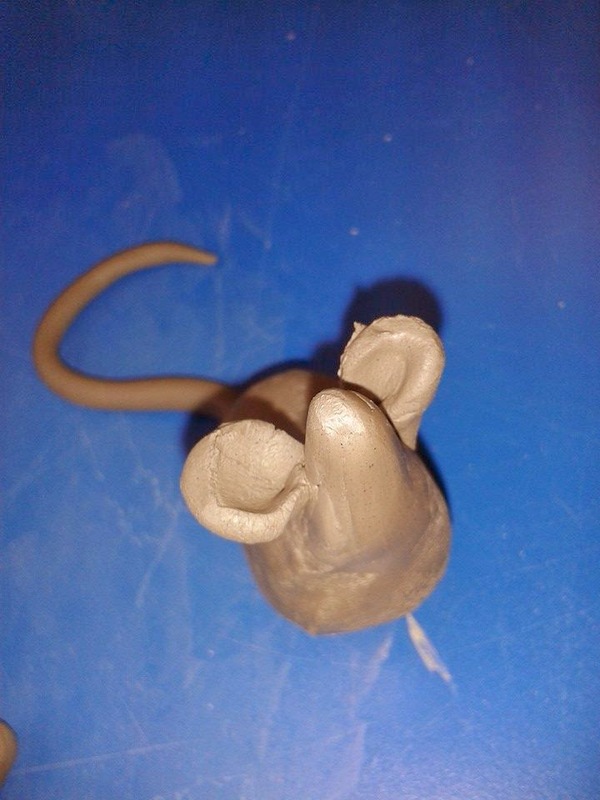 Basically we had to roll our clay between 2 long rulers as thinly as possible. Using a pattern I made a rectangular box, with lid and a mouse. They have to be left for a week to harden like leather. 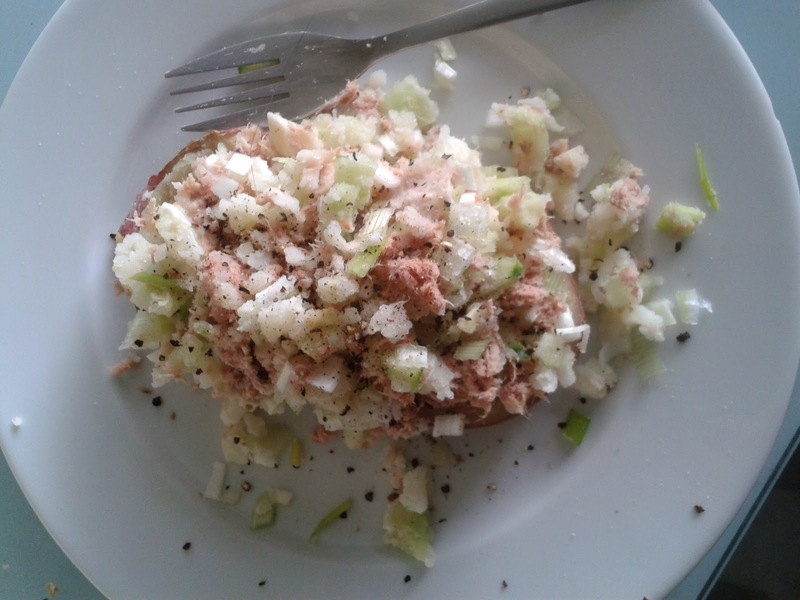 Next week I will assemble my "cheese dish/tray"
I am a fan of a jacket potato, in fact when I decided to share my photograph for my ABC contribution I had to make one - in this case tuna, extra light mayonnaise, spring onion and cucumber. Jacket potatoes are a great way to use up food - I have many favourites but an indulgence would always be just butter! Whilst I often microwave the potatoes nothing tastes anything like the crispy skin of an oven cooked one. We have had some lovely weather of late and have had a couple of expeditions on the motorbike, as well as walks on the beach and catching up on garden jobs. 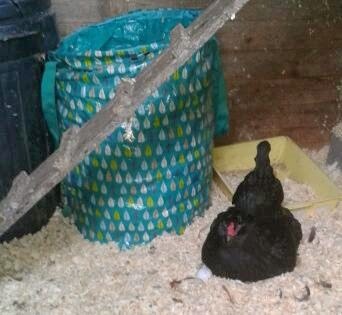 The henhouse has had a spring clean - today I noticed Bev lurking around the door - she is laying again, only moments after I captured this photo a blue egg appeared. Eva sits on the shelf to lay hers, whilst Mabel and Olwyn choose the corner of the shed, so we are up to full production now. The sky is taking on a distinct dark grey colour which could bring the rain we are to expect - so this means the next DIY task will be the de-cluttering of bedroom 2 ready for re-plastering and decorating. Ideal job for bad weather day! 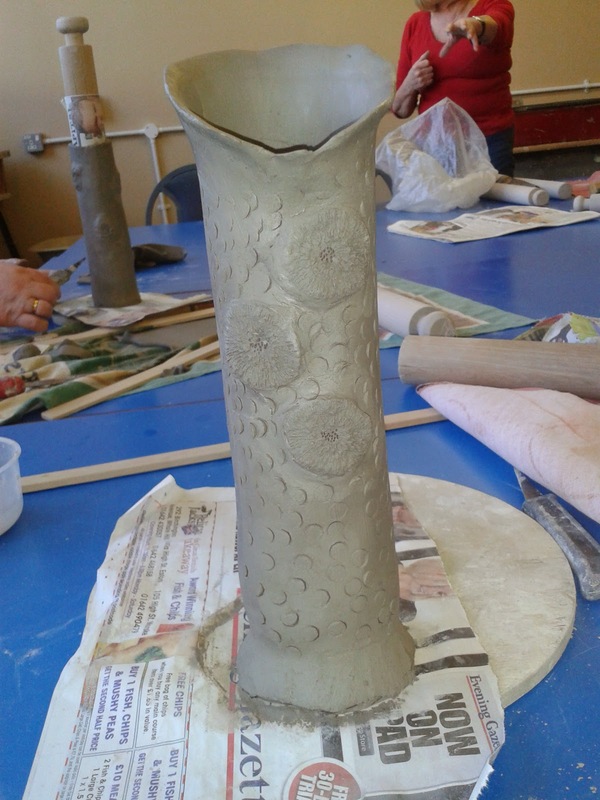 Today there was only 4 of us at class and as our previous efforts were awaiting a space in the kiln we were shown how to make a cylinder vase. 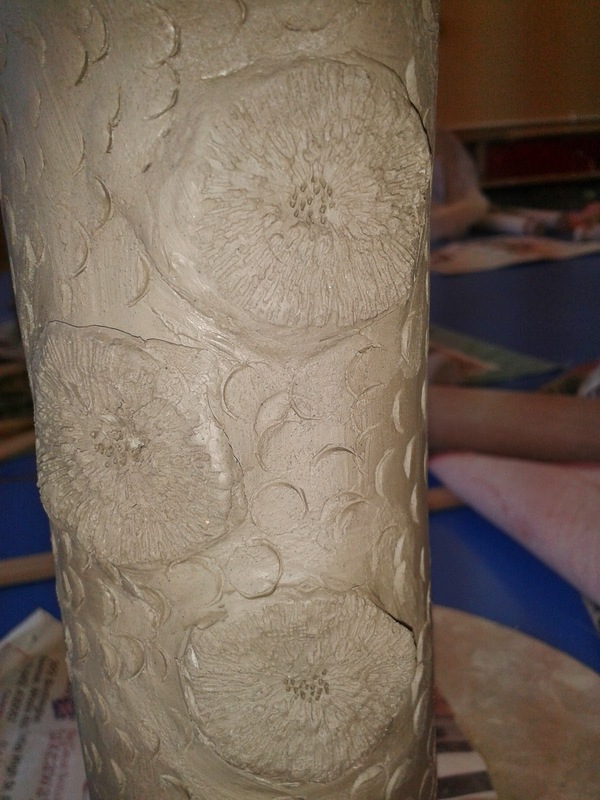 The top was fluted and we used a type of mould to make embellishments. For the letter I in my ABC Adventure I have got to ramble on about my favourite food - and that is Indian curries. We have an excellent restaurant in Guisborough which we have used for nearly 25 years, needless to say we are well known there both for takeaways and restaurant meals. I enjoy cooking curries for friends and family when we have occasions to celebrate or just a supper event as they can be prepared in advance allowing more time to spend around the table chatting. I have recently bought an electric spice grinder so as I await its delivery I have looked up some of our favourite curries and found a healthy version of the recipe. The family are coming round for Mother's Day on 30th March so I am going to prepare a selection in advance for the freezer, so on the day itself I will be able to spend time round the table and leave the curries in the heated trolley - a godsend on such an occasion! Balti is more a style of cooking than one particular curry. The word balti can be translated as "bucket" (i.e. a cooking pan) and some say the style of cooking is indigenous to an area of northern Pakistan known as Baltistan. A balti pan is basically a karahi which has the shape of a Chinese wok but with 2 small round handles on either side of the pan instead of one long handle. In specialist "Balti Houses" the balti is a meal in itself which contains both meat and vegetables and is eaten straight from the karahi using curled up pieces of nan bread. In standard Indian restaurants the balti is more of a stir-fried curry containing plenty of fried green peppers and fresh coriander Medium hot. 1 Measure out the 8 spices into a bowl (first 8 ingredients). Warm up a large skillet or pot (ideally cast iron) and bring to med-high heat. Gently roast the spices in the dry skillet -- watching the mixture doesn't burn, keep stirring. After about a minute it will become fragrant and begin to get dark - take it off the heat and pour back into the bowl - set aside. 2 Put the skillet back on the heat, add frylight and bring back to medium high heat. Add in the chopped onion and cook through until translucent. Once the onion is cooked, add in the ginger and garlic and mix well - watching the garlic doesn't burn. Next add the spice mixture back in, followed by the tinned tomatoes. 3 Mix in about 1 cup of water - you want a thick sauce, but not too paste-like. Add in the salt, bay leaves and cardamom seeds. 4 Grate the zest off of the lemon, add to the pot, along with the juice from 1/2 of the lemon. Save the other half for later, you may want to add more. Let it all simmer on medium-low. 5 For a nice smooth sauce, remove the bay leaves and blend until smooth (an immersion blender works well). Bhuna is first and foremost a cooking process where spices are gently fried in plenty of oil to bring out their flavour. The dish "bhuna" is an extension of that process where meat is added to the spices and then cooked in its own juices which results in deep strong flavours but very little sauce. The restaurant bhuna is a well spiced curry with a thick sauce. It is often garnished with fried green peppers ( bell peppers) and shredded onions. Usually medium hot . Biryani is not a curry at all but the curry connection comes from the mixed vegetable curry with which it is served in most Indian restaurants. Biryani originated in Persia and, at its simplest, was rice and meat baked together in the oven. The cooks to the Moghul emperors took the biryani and transformed it into a courtly delicacy by adding aromatic spices and other exotic ingredients. Traditionally, biryanis are baked in the oven for some time so the aromatic spices and juices from the meat permeate the rice. In the Indian restaurant, however, all the dishes are made to order and the poor chef has to find a way of preparing the biryani in double quick time. So the restaurant biryani is often just pilau rice stir fried with chicken Mild. While the vegetables are roasting, stir together the stock, currypowders, chilli, saffron and mustard seeds. Mix the rice and green beans with the vegetables in the tin, then pour over the stock mixture. Lower the oven to 190C/gas 5/fan 190C. Cover the dish tightly with foil and bake for 30 minutes until the rice is tender and the liquid has been absorbed. Stir in the lemon juice and check the seasoning, serve. A famous Parsee dish. Interestingly the dhan part of the name means rice and a dhansak is traditionally served with a pulao of fried and spiced rice. An authentic dhansak will made with lamb and contain vegetables and many different types of dhal (the sak in the name). The curry house dhansak is often referred to as "hot, sweet and sour with lentils". The "hot" is chilli powder, the "sweet" is sugar and the "sour" is lemon juice. Curry houses commonly use masoor dhal (split red lentils) but some restaurants now use chana dhal to good effect. If it is done well the dhansak is an excellent curry with contrasting flavours and textures. Dhansak is a popular Indian curry made from meat and lentils, flavoured with spices including cumin and ginger. It is mild, sweet and rich with just enough heat to satisfy most tastes. And best of all it benefits from being made a day in advance as it tastes even better the next day. I like to serve this with Raita and Fresh Tomato Relish, as well as hard-boiled eggs, poppadoms, rice and, of course, mango chutney. Heat Frylight in a large frying pan. Add half the lamb and fry until browned. Remove from the pan with a slotted spoon and set aside, then brown the other half of the lamb and set aside. Add Frylight to the pan. Add the onions and fry for 4-5 minutes until beginning to soften. The dopiaza is a classic Indian dish dating back at least to Moghul times. The name dopiaza broadly translates as "2 onions" or "double onions". Some traditional versions of the dopiaza use twice the weight of onions compared to the weight of meat but a classic Indian dopiaza is more likely to use the onions in 2 different ways, fried and boiled, at different stages of the cooking. The restaurant version has small fried pieces of onion in the sauce and then larger chunks of lightly cooked onion are added towards the end of the cooking. Medium hot. Heat a griddle or small, flat pan on a medium flame and gently roast the coriander and cumin seeds till aromatic. Remove from fire and grind into a corase powder in a clean, dry coffee grinder. Keep aside for later. Separate the chopped onions into 2 portions - roughly 2/3 and 1/3 of the whole. HeatFrylight in a large pan on a medium flame and add the first lot of onions - the 2/3 portion. Fry till golden. Add the chicken and fry till browned. Add all the powdered spices, ginger and garlic pastes and tomatoes and fry until the oil begins to separate from the mixture. Add salt to taste. Add the remaining 1/3 portion of chopped onion and mix well with other ingredients. Sauté until this batch of onions is soft and translucent - 3-5 minutes approximately. Reduce flame to a simmer and cook till the chicken is tender. This dish, when cooked, requires that the gravy only be enough to coat the chicken thickly. If it is not so, cook to reduce the gravy to required consistency. Jalfrezi is not a traditional Indian dish as such but, like the bhuna, is actually a method of cooking. It literally means "hot-fry" but is probably better translated as "stir-fry". The term jalfrezi entered the English language at the time of the British Raj in India. Colonial households employed Indian cooks who would use the jalfrezi method of cooking to heat up cold roasted meat and potatoes. But the restaurant jalfrezi is not a version of the Anglo-Indian dish. Oh no. The Indian restaurant chef uses the jalfrezi method to stir-fry green peppers, onions and plenty of green chillies as the basis for a curry with just a little sauce. The chillies make the jalfrezi taste very fresh but also make it one of the hotter curries on the restaurant menu. Place the chicken between sheets of clingfilm and flatten with a rolling pin. Remove the clingfilm, cut the chicken into strips and set aside. Prepare the other ingredients. Finely slice the onion, dessed and slice the peppers, crush the garlic and grate the ginger. Spray a pan with fry light and cook the onion, peppers, garlic and ginger for 6-8 minutes. Add the curry powder, ground cumin and coriander. Season and stir fry for 1-2 minutes. Throw in the chicken and cook for 4-5 minutes. Roughly chop the coriander and stir into the pan along with the tomatoes and 100ml water. Cover and simer for 15 minutes or until the chicken is tender. Serve. A traditional korma will have a long slow cooking. In fact, korma is not one particular dish but rather a method of cooking similar to braising. Because korma is a cooking method there are a wide variety of dishes that could be described as "korma". Many kormas call for the meat to be marinated in yoghurt and then the meat plus marinade are braised on a very low heat until all the juices condense down into a thick sauce. The restaurant chef has to cook to order so doesn't have time for long, slow cooking. The korma you find in Indian restaurants usually contains ground almonds, coconut and thick cream. It is often described on restaurant menus as being "very mild" but a good korma should not be bland. 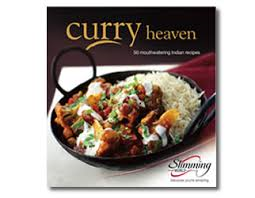 This is a diet-friendly chicken korma from the Slimming World book Curry Heaven which I adapted slightly. Remove from the pan when cooked, then fry the onion and garlic and add the spices; fry for a couple of seconds then pour in the stock.Add the bay leaf and cinnamon stick and tin of tomatoes and cook until reduced a littleReturn the chicken to the pan and stir in the yogurtServe with rice and vegetables. The curry house Madras is a restaurant invention which started life as simply a hotted up version of the standard restaurant curry. Because it is a restaurant invention rather than a traditional recipe the Madras can vary considerably from one restaurant to another. The restaurant Madras can be hot or very hot, red or brown, a hotter version of a plain curry or quite rich in tomatoes. Mostly though it comes with plenty of sauce and is strongly spiced . It is the standard restaurant hot curry. Beef Madras 2. from SW Curry Heaven. Chopped coriander to garnish (I use Asda frozen)Spray pan with frylight . Add the onions, cloves and cardamom pods. Stir fry for 3-4 minutes. Add thw ground coriander and cumin and stock. Transfer to oven and cook hor a few hours OR transfer to slow cooker and cook all day. Rogan josh is another all time favourite on the curry house menu. It was originally a Kashmiri dish but is equally at home in the Punjab. An authentic rogan josh will be made with lamb and may, at its most elaborate, contain dozens of spices. The Kashmiri and Punjabi versions do differ (the Kashmiri does not traditionally contain onions or garlic) but they are both highly spiced and share a deep red colour derived from the liberal use of dried red Kashmiri chillies. The curry house rogan is also red but the colour comes from red peppers and tomatoes rather than Kashmiri chillies. The restaurant rogan is characterised by its garnish of tomato pieces and fresh coriander. It is usually medium hot. Chicken tikka masala is the all time most popular dish on the Indian restaurant menu and what the restaurant diner really needs to know is whether the restaurant is providing a good example of the dish. And what is a good example? Well, the chicken tikka pieces should be aromatic and slightly smoky from the tandoor. The masala sauce should be well spiced but not hot, rich and creamy and have a hint of coconut. Tikka masala usually has a deep red colour, gained from the use of artificial food colourings. MethodWash the chicken and cut into cube size pieces and set aside. In a blender add the 2 large chopped tomatoes, 1 tbsp chopped cashew nuts and blend together. MarinationNow in a bowl add turmeric, chilli powder, coriander powder, 1 tsp ginger garlic paste, ½ tsp fenugreek leaves, 1 cup fat free yogurt, squeeze half lime, ½ tsp salt, mix all the ingredients together. Take half the marination and in a separate bowl coat the vegetables (cubed onion, tomato, bellpeppers). Use the other half of the marination to coat the chicken.Soak some wooden skewers for 30 mins to avoid burning when ready for use. Prepare your chicken skewers using the chicken and vegetables, alternating. Now spray a griddle pan (you can use a normal frying pan) with frylight, cook the skewers rotating to cook both sides. Any extra vegetables can be placed on top of the skewers to cook alongside. TikkaSauceIn a fry pan add 1 tbsp olive oil, add cinnamom stick, green cadamoms, cloves, bayleaves, add cumin seeds and 1 large onion very finely chopped, add a pinch of salt, pinch of mace, . Fry the onions until nice golden brown . Add turmeric, 1 tbsp ginger garlic paste , 1 tbsp cumin powder,1 tbsp coriander powder, ½ tsp chilli powder. Make sure the flame is low when adding the spices or they may burn. Add ½ cup of water mix well. Once the masala has turned brown and cooked, add your tomato and cashew paste from the blender ,add ¼ cup water to this, cover the lid and let it simmer on low flame for 5-10minutes to allow all the flavours to combine together. Now lift the lid and add a ½ tsp of fenugreek powder into the sauce. Now remove your chicken tikka pieces from the skewers and add to the sauce with all the vegetables. Garnish with fresh coriander leaves. The vindaloo was originally a Portuguese dish which took its name from the 2 main ingredients which were "vinho", wine/wine vinegar, and "alhos", garlic. Over time it was spiced up, hotted up and otherwise changed by the indigenous peoples of the ex-Portuguese colony of Goa. Not many restaurants produce an authentic Goan vindaloo not least because the pork used by Christian Goans in their recipe would not be acceptable to Muslim chefs. In some restaurants the vindaloo is just a pumped-up Madras i.e. the same recipe but with lots more chilli powder. Other restaurants have interpreted the "aloo" part of the name as meaning potato and introduced diced potato to a hot standard curry with added lemon juice for tartness and black pepper for extra pungency. Very hot. A Chicken Vindaloo, doesn't have to always be blow your head off hot, you can control how much heat you like, by the amount of chilli you add. This recipe is syn free on extra easy. To make the paste put all the whole and dry spices into a spice grinder and grind to a powder, mix with the rest of the paste ingredients. Cut the chicken into chunks and rub the paste into it, marinade for at least an hour. Spray a large pan with frylight and fry the onions till soft and golden, add the garlic and ginger, fry for 2-3 minutes. Add the stock and boil for 10 minutes, stir in the turmeric and cook for 2 minutes. Add the chicken, tomatoes and ¼ pint water, bring to a boil then simmer for 45 minutes, until the chicken is cooked and the sauce has thickened. Serve with boiled rice or on a baked potato, with a lovely bowl of salad. For more ABC exploits follow the link in my sidebar. H is for Healthy Pancakes.